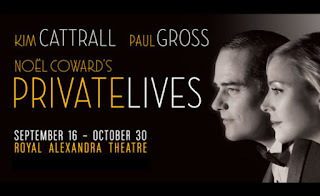 This a review of the current staging of Noel Coward's Private Lives from Mirvish Productions running at the Royal Alexandria Theatre here in Toronto. What she also brings is a great deal of fire (not so surprising) and a real gift for physical comedy. And trust me, for all Coward's rapier sharp dialogue, this production is very physical. These jet setters jab with more than just their tongues; records, pillows, picture frames and other props are all transformed into projectile weapons. Cattrall is not afraid to let herself go, to attack her part with bones and teeth and perfectly coiffed blonde hair all to hilarious results. The other powerhouse Canadian star in this production is Paul Gross. 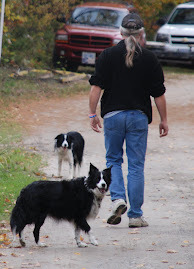 Yes, Paul Gross the mountie from Due South but also the star/writer/director of Men With Brooms and Passchendale. His range has always impressed me as has his humour, it veers from the absurd to the ironic and is perfectly suited to Noel Coward. His accent is spot on and at the beginning of the play as he too is on his on his honeymoon, he comes across as a slightly more acidic Cary Grant. As he meets his recently divorced lover (Cattrall) his veneer quickly dissolves and the acid oozes forth; in the second act as all the characters are united and try to iron out the mess, we watch Gross trying to hold in the emotions and as he can't, as the acid bubbles out of him like emotional lava, he gives us one of the funniest performances I've seen on stage in a long long time. It's a five person cast, and as the newly married soon to be discarded spouses, both Anna Madeley and Simon Paisley Day hold their own extremely well. You want to feel sorry for them but watching their pain at the hand of these two cads is really really funny. The fifth member of the cast is Caroline Lena Olsson as a French speaking maid whose Gallic reserve in the face of all the insanity hits all the right notes. Private Lives starts out as a comedy of manners but quickly devolves into a madcap comedy, at least in this production but there is also a nice streak of social commentary, the whole idea of what is acceptable to define as love and what a couple makes. Thankfully this is addressed but not overstated: This is a comedy. A well written, superbly acted comedy and the director and cast are quite happy if they do nothing but make us laugh out loud.